There is very little in the way of contemporary art from the Great Hunger. 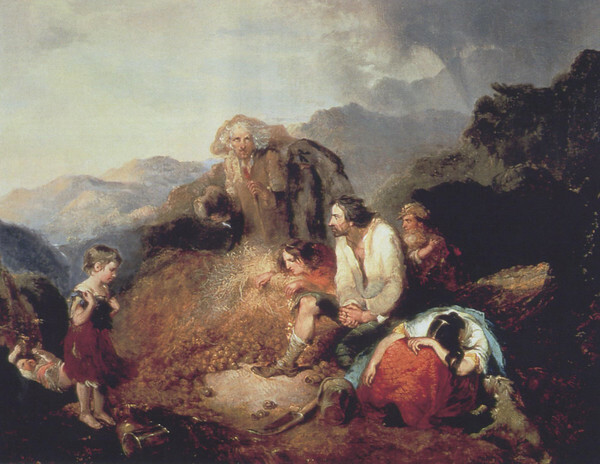 One of the best is the painting shown below entitled The Discovery of the Potato Blight in Ireland. It was originally entitled The Irish Peasant Family Discovering the Blight of their Store but was shortened, either by the artist or someone else, after its painting. The painting depicts a stunned family looking at a ruined crop. Everyone is huddled around a rotting pile of potatoes. There are several items of note in the painting. It includes at least three and possibly four generations in the family sharing the potato field (as well as a dog). The looks of despair and defenselessness are especially disheartening, particularly the older man with a top hat and cane looking up to the heavens. The picturesque landscape, with brighter blue sky on the left and looming thunder clouds on the right, captures the mood. Perhaps the most poignant aspect of the painting is the crying woman. The painting is at the University College Dublin. 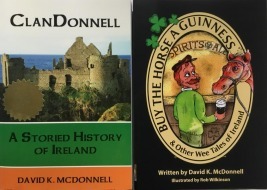 It was purchased by author Cecil Woodham-Smith at an auction in 1966. She promptly donated the painting to the university in gratitude for the university's help in writing her 1962 seminal book The Great Hunger - Ireland 1845-1849. The painting hangs in the corridor of the National Folklore Collection on campus.